Randolph students Kemar Belle (left) Chris Lightbourne work at Dave & Buster’s restaurant in Braintreee. TAPPING INTO THEIR TALENTS: Billy Pace, a student at Randolph High School and son of Randolph Police Chief William Pace, works at AMC Theatres in Braintree, and has a long-term goal of working for the state or local police. Before that, he worked in shipping and receiving and the fast-food industry. He said a program run by Malden-based Triangle Inc. which trains people with disabilities for employment was instrumental in finding him work, which statistics show isn’t easy. According to Triangle’s community relations director, Jeff Gentry, about 21 percent of those with disabilities are employed. Alpha Sanford, Randolph High’s assistant headmaster, said the program, now in its second year in Braintree, has been very successful, with all 14 students landing jobs last year and all 17 this year. The school had another job-training program before, she said, but was looking for one better suited to “train students with severe disabilities to become independent after high school. Triangle was the one that spoke to our vision. . . The school, which also works with mainstream students to ready them for the workplace, has other programs in place for students with disabilities, she said, including a pre-vocational program run by teachers Stephen LeClair, Michael Maher, and Brian Cartwright. The school also works with local partners, including Stop & Shop, Shaw’s, the Randolph Recreation Department, and Sullivan Tire Co., to find work for students, she said. Though much of the work is part-time, it does lead to full-time opportunities, Sanford said. 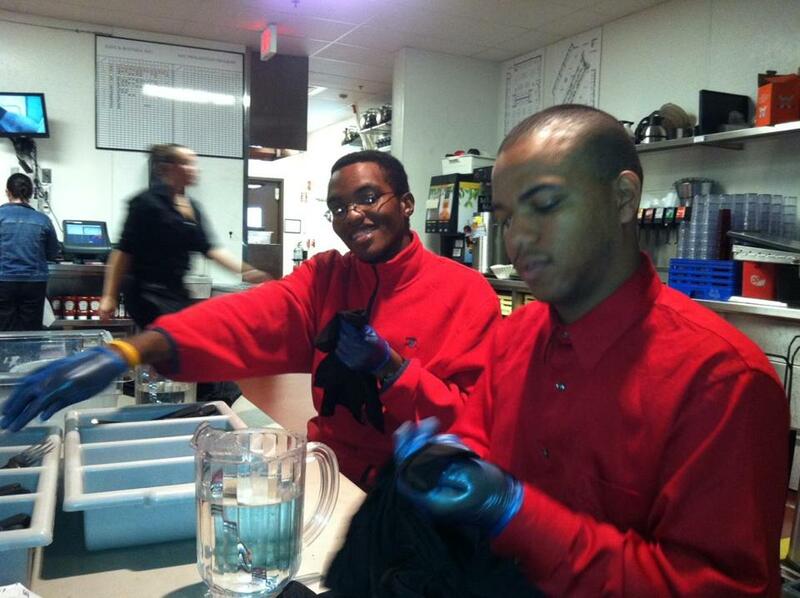 Two students with disabilities started working at a Talbots while in school, and got full-time jobs after graduation. For information on the program, visit www.peoplewithability.org. SCOUTS TO HONOR SOX SLUGGER: Quincy-based Boy Scouts of America Old Colony Council will honor Hall of Famer and former Boston Red Sox outfielder Jim Rice with the Distinguished Citizen Award at its awards dinner at the Boston Marriott Quincy Nov. 21. The annual fund-raiser benefits scouting programs, and Rice will be recognized as an exemplary community leader, said Rick Stritzinger, scout executive and CEO of the council. Rice played his entire 16-year career with the Sox, winning the 1978 American League Most Valuable Player Award and two Silver Slugger awards. He was elected to the Hall of Fame in 2009. STUDENTS SHORN FOR CANCER CAUSE: Thomas Cavanaugh, dean of students at Blue Hills Regional Technical School in Canton, said he hasn’t worn his hair short since the fifth grade. But he recently had his head shaved by cosmetology student Julie McNeil of Holbrook, as part of a fund-raiser for cancer research. Students in the school’s cosmetology program, along with students throughout the school, took part in “Cuts for a Cure” on Oct. 25. Every half-hour on the day of the event, 10 males had their heads shaved for the cause, while 10 females had their hair shorn by several inches. The event, sponsored by the American Cancer Society and orchestrated at the school by its National Honor Society chapter, raised about $2,000 from donations for pink lapel ribbons and for watching the students, and Cavanaugh, get haircuts. Handing out the ribbons was junior Bridget Kelley of Avon, who had suggested the school hold the event. “We’re all coming together as a community to show our support for cancer victims and their families,” she said. TRUSTEES HONORS WORKERS: Meghan Kelleher of Norwood was named employee of the year by the Sharon-based Trustees of Reservations at the land-conservation agency’s annual meeting. Kelleher, executive assistant to trustees’ president and CEO Barbara Erickson, has been with the agency for eight years and helps Erickson connect with volunteers, donors, foundations, partners, and a staff of more than 400. The agency also recognized Steven Sloan of Belmont, who works mainly out of the Sharon office, for 15 years of service. He manages 43 statewide properties, among them Bird Park in Walpole, and has been directly responsible for some of the agency’s recent acquisitions, including East Over Farm in Marion and Rochester and the Ames property in Easton.